2 Bedroom Link Detached House Bungalow For Sale in Clacton-on-Sea for Offers in excess of £250,000. 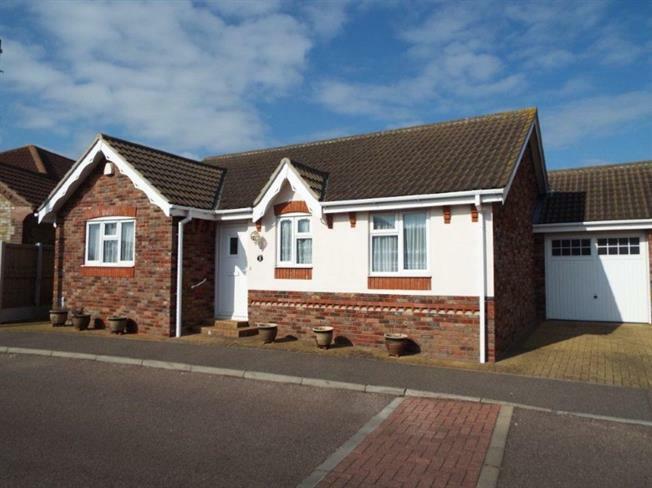 Being sold with no onward chain, Bairstow Eves are pleased to offer for sale this delightful two bedroom link detached bungalow located within the popular surroundings of Great Clacton. The property was built circa 2012 and features lounge, kitchen, bathroom, en-suite to master bedroom, garage, driveway and enclosed rear garden. The property is within easy reach of Clacton shopping village and local amenities and is presented in good decorative order throughout so please call to arrange your viewing. Radiator, laminate flooring, built-in storage cupboard. UPVC patio double glazed door, opening onto the garden. Double glazed uPVC window facing the rear overlooking the garden. Radiator, carpeted flooring. Double glazed uPVC window facing the front. Radiator, tiled flooring, tiled splashbacks, spotlights. Fitted units, stainless steel sink and with mixer tap with drainer, integrated oven, integrated hob, over hob extractor, integrated dishwasher. Double glazed uPVC window with obscure glass facing the rear. Heated towel rail, tiled flooring, tiled walls, spotlights. Low level WC, walk-in shower, top-mounted sink. Double glazed uPVC window with obscure glass facing the front. Heated towel rail, tiled flooring, tiled walls, spotlights. Low level WC, panelled bath with mixer tap, top-mounted sink with mixer tap.